"It’s a quick and easy project, but a high impact one. I wanted to use bold, graphic prints in a simple motif. Mediterraneo by Katarina Roccella for Art Gallery Fabrics. 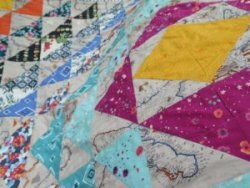 I used the large scale prints in bright colors and made big half square triangle (HSTs) to show off the designs. To keep it light and drapey, I used flannel in place of batting so it’s not too heavy. 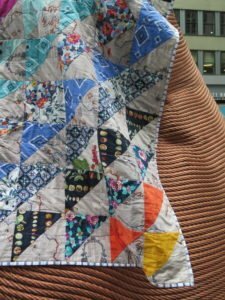 It can be a picnic blanket or even a summer quilt. The whole project could be put together in a long weekend."